The purchase requests are sent to an appropriate supplier. With Orderhive being a data connector, we can automatically map the custom data fields between Magento and QuickBooks. 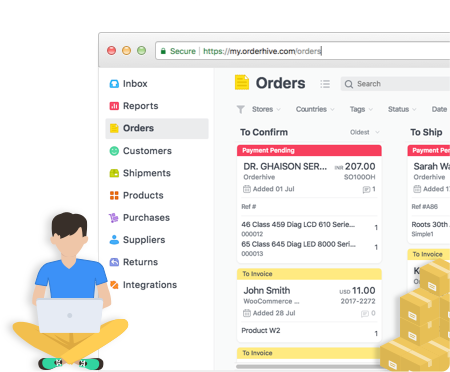 The provision to add line items like "handling fees" in Orderhive and exporting the same to QuickBooks helps us handle all our financials in one place. Girvin Marketing works with companies of all sizes to provide custom branded products for sales, merchandising, trade shows, gifts, and promotions. They provide a full-service approach with in-house design, sourcing, online eStores, warehousing, fulfillment and distribution services. While venturing into the online space, Girvin Marketing started building a centralized vendor portal for ordering all corporate promotional products. The portal enables customers to efficiently place orders within a Girvin storefront and allows suppliers to instantly review the order information and stay connected with their customers during the purchasing cycle. Purchasing can be a time-consuming process especially when the requests for goods and services have to be processed manually using a combination of emails, paper catalogs, faxes and verifying the same with rigorous follow-ups. Girvin was using Magento as our e-commerce platform as it supports custom fields, which help them send the order information to the right supplier. The custom fields also include a unique supplier id and invoice details which need to be synced with QuickBooks so that the corresponding supplier can track payables at any point during the billing cycle. Orderhive strategically automated each process of Girvin’s business workflow. Once the customer places an order in Magento, everything from custom field integration to order status update is handled as per Girvin marketing’s workflow. Custom integration with QuickBooks helps Girvin Marketing to sync custom fields such as sales invoice email address and suppliers id to the existing QuickBooks transaction objects. They were also able to apply business logic which automatically maps the custom fields and designates “sales orders” to the appropriate supplier. The biggest advantage was that Orderhive automated Girvin marketing’s entire workflow so repetitive tasks glide on their own without the extra push. With automation, they have zeroed down the chances of transactional error.